Outdoor grilling is the perfect way to get the family together and enjoy the summer months, as well as special sporting events. To get the most out of your grill, you must consider its construction, the cooking area, and the heating capability. This article is going to cover ten of the best rated gas grills available, based on user reviews, availability, and ratings. 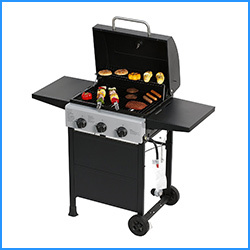 The Smoke Hollow 205 is one of the best rated gas grills available. 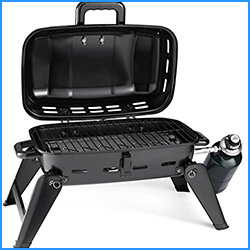 It features a 10,000 BTU burner that is more than adequate for your favorite grilled items. The stainless steel exterior is very easy to maintain, and very durable as well. The legs are fully collapsible for easy storage, and the compact design is perfect for tailgating parties. 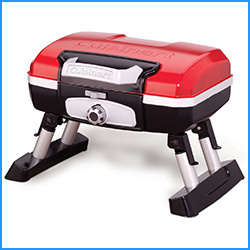 For users on a budget, this is one of the best rated gas grills available from Char-Broil. When not in use, the legs fold over the lid to lock it in place for easy carrying. The handles are also heat resistant, for added safety and convenience. With a durable steel frame and its compact design, this is an excellent choice for most users. You can purchase yours directly on Amazon, which offers product protection plans as well. The Cuisinart CGG-180T has a 145 square inch cooking area that is more than adequate for small get-togethers and personal barbecues. The 5,500 BTU burner distributes heat evenly thanks to the porcelain enameled grate. It comes in three different color choices, and weighs just over 13 pounds when fully assembled. 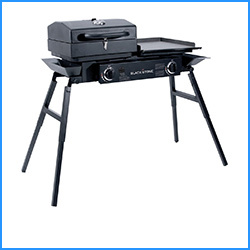 This Blackstone portable grill is another one of the best rated gas grills out there. With 260 square inches of cooking area, it is more than capable of handling the cooking needs of a typical family hosting an event. 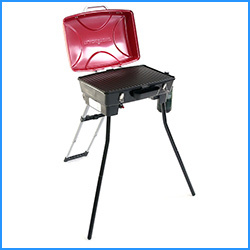 Cleaning the grill is easy, and there is an option for a griddle kit as well, that provides additional functionality. This model also uses standard one-pound propane bottles, and features an easy-to-use igniter system. The grill comes with free shipping, and can be purchased on Amazon. 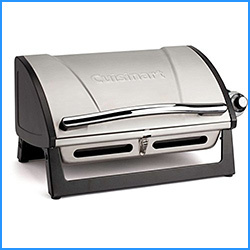 For users who prefer a more modern look, the Grillster by Cuisinart is one of the best rated gas grills for you. This model has a beautiful chrome and silver finish that holds up well in the outdoors. The cooking grate is also dishwasher safe, for added convenience. 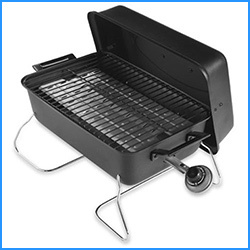 The grill is covered by an impressive three-year warranty period from the manufacturer, and easily stores away. If you’re seeking a larger unit, you should know the Blackstone Grills Tailgater is full-sized, without breaking the bank. It has a unique portable setup that doesn’t require any tools. 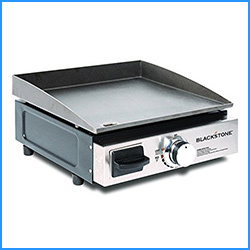 With a griddle top and two open burners, it is more than adequate for virtually any occasion. The grill is also backed by a money-back guarantee. Purchasing it on Amazon means you get free shipping. 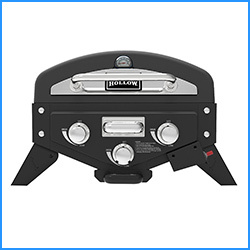 The Smoke Hollow VT280SS1 is a unique gas grill. One of its most interesting features is the smoking pan where you can add various wood chips to help customize the flavor of your food. It also has an easy-to-clean drip tray that makes maintaining the unit a breeze. The porcelain coated cooking tray also distributes heat evenly throughout the cooking surface. If you’re looking for a larger grill, the Smart Space by Master Cook is one of the best rated gas grills to consider. It has foldable shelves in the cooking area to help cook a variety of different foods at the same time. With its rolling design, you can easily move it from one area to another. The three burners put out a total of 30,000 BTUs of combined heat, making this one of the most efficient models available. If you’re on a tight budget, but still looking for quality, this gas grill by Expert is likely your best choice. It has enough cooking space to cook up to 10 burgers at once. With 10,000 BTUs of heat, it is a perfect fit for your next family cookout. It is also one of the most lightweight choices available, and is very easy to assemble. You can purchase it from Amazon, and take advantage of free shipping. The Dash by Blackstone is the perfect match for those of you who want something portable, without sacrificing valuable table space. It sets up in just a few minutes, and offers enough cooking space for ten burgers. There is a griddle attachment you can purchase as well, to greatly expand your cooking possibilities. The burner generates up to 7,000 BTUs of heat, and the grill itself is remarkably easy to clean. 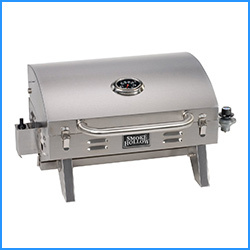 The ten grills covered in this article are among the best rated grills available. They feature durable construction materials and impressive cooking areas. Take your time and pick the one that is best suited for your needs. Once you’ve tried it out, tell us about your experience with it.